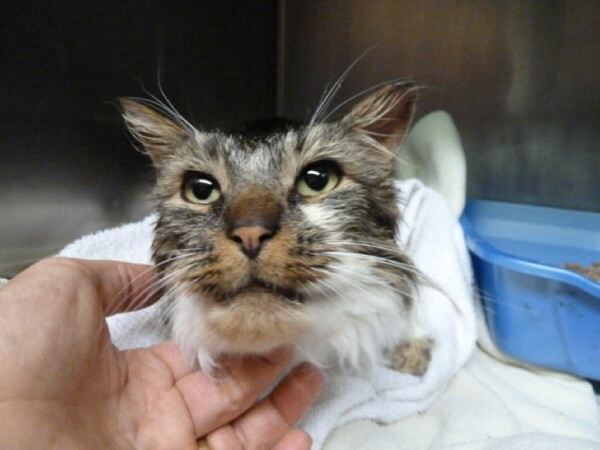 This cat was rescued by Belfast municipal employees and residents after getting stuck in a storm drain on New Year's Eve. BELFAST, Maine — City Council meetings in Belfast are usually a forum to debate and decide municipal business, but councilors heard a much sweeter and more compassionate tale on Tuesday night. Resident Glenn Montgomery stood up during the public comment portion of the meeting to laud the city workers who spent about an hour outside in the cold on New Year’s Eve to rescue a cat that appeared to have slipped through a stormwater drainage grate and gotten its head stuck between the metal bars. Montgomery said later that the cat’s ordeal first was noticed by his friend Sara Holmes, who was on Pine Street when she saw the animal’s head protruding from the stormwater grate about 3 p.m. Dec. 31. Holmes called Montgomery and his wife, Cary Slocum, for help. He and his wife rushed over to Pine Street and saw Holmes down on the ground with her hands through the grate, trying to hold up the cat’s body. Slocum went to the Belfast Police Department to seek assistance, and Police Chief Mike McFadden, Officer Mike Rolerson and Belfast Public Works Director Bob Richards all went to help. They worked for nearly an hour to free the grate, which had frozen to the ground, Montgomery said. Meanwhile, he and Holmes continued to hold on to the cat, which was bloody from its struggle to free itself from the grate. The grate was free, but the cat was still stuck in it, he said. Somebody in the group went to a nearby home for some olive oil, which they tried to use as a lubricant, but to no avail. Then Slocum went to the home of veterinarian Mike Shershow, who came straight away, Montgomery said, and used “some kind of veterinary magic” to free the trapped animal. Shershow took the neutered male cat to the Belfast Veterinary Clinic and put it in an incubator, because its body temperature was very low. Aside from a frost-bitten ear, the animal is doing well, and although efforts to find its owners have so far been unsuccessful, Montgomery said that someone has stepped up to adopt the cat. “I was just so thankful for the efforts of all these people, who on a New Year’s Eve day were willing to give up what they were doing and do what it took to free this poor cat,” he said.